In this year of superheroes and sequels, with intrusive digital effects everywhere you turn and an actor who should know better wearing a stupid dead crow on his head, it is July and I’ve been to the movies exactly twice. 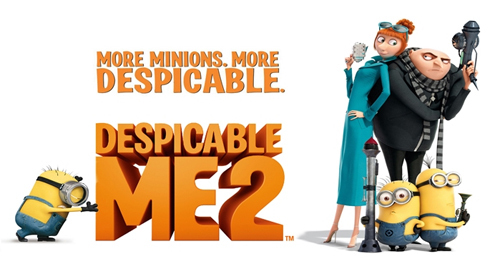 I had the most fun at Despicable Me 2, and was delighted to find it a beautifully crafted film. If you’ve been waiting…and waiting…and waiting some more for a movie worth venturing out to the cineplex, the drought has lifted with this one. Disclaimer: I get nothing in return from anyone for writing this review, but I’m still sort of hoping that karmic forces, somehow and somewhere may award me a minion or two for my efforts. Come on – wouldn’t you like a few of the happy little guys to do the chores around your home? This entry was posted in Movies and tagged 2013, movies. Bookmark the permalink. I knew I was in trouble from the beginning when I saw the minions, because they are not my favorites at all. Good review. I don’t really think of it as a real review, where you expect to find one or more critical statements, but thanks. Actually here’s something I forgot to mention: the theater was crowded. A lot of young kids, quite noisy, leading me to wonder if it might be too much. But once the lights went down, everyone was riveted. No sounds but the usual “ooooh’s” and “ahhhhh’s.” Simply a fun movie. I LOVED the first movie. I’m definitely going to see this one, and I might not even wait for it to be released on DVD. I might just drag myself and my hubby to the cineplex. Thanks for the heads up. I think it’s worth a trip to the theater, but you’ll enjoy it either way.